Written by th. Posted on June 28, 2009. Filed under Carbon Fiber. Tagged carbon, composite, fiberglass, frp, gaming, joystick, product. Bookmark the Permalink. Post a Comment. Leave a Trackback URL. The stick is finished! A good amount of time was spent sourcing tools and waiting to use the lab or work shop. ★ Carbon and glass fibre sandwich construction. 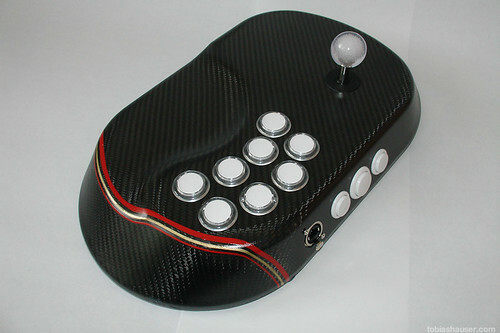 ★ Exterior is clear coated carbon fibre with 3 red and gold pin stripes (made in germany!). ★ 6mm clear acryl base plate. ★ 6 rubber feet with screws. ★ Multi-fit mounting plate: Will fit both Seimitsu LS-32-01 and Sanwa JLF-TP-8YT joysticks. ★ Both Sanwa and Seimitsu brand screw-in buttons work. ★ Clear Seimitsu ball top. ★ 8 x 30mm clear white Seimitsu buttons on the surface. ★ 1 x 30mm white Seimitsu button on the rear as PS3 home and 360 guide button. ★ 2 x 24mm white Seimitsu buttons on the rear as start/back. ★ Dual PCB Xbox 360 and Chtulhu. ★ RJ-45 mod: Only one cable at a time, different cables for the systems will all fit to the same jack. ★ Quick disconnects for all buttons: Each button can be swapped easily. ★ Inter-PCB connection via SUB-D 25 connector: Each PCB can be removed separately.